Today, Placer Community Foundation CEO, Veronica Blake, attended the Placer County Board of Supervisors meeting where she advocated for affordable housing. Following, the board authorized county staff to execute a ground lease agreement with Mercy Housing which is the next step toward building a multi-family/workforce housing development on approximately 3 acres. The proposed facility layout includes three 3-story apartment buildings, seven 2-story attached town homes, a multipurpose community building, common green space with outdoor play equipment, and associated parking. 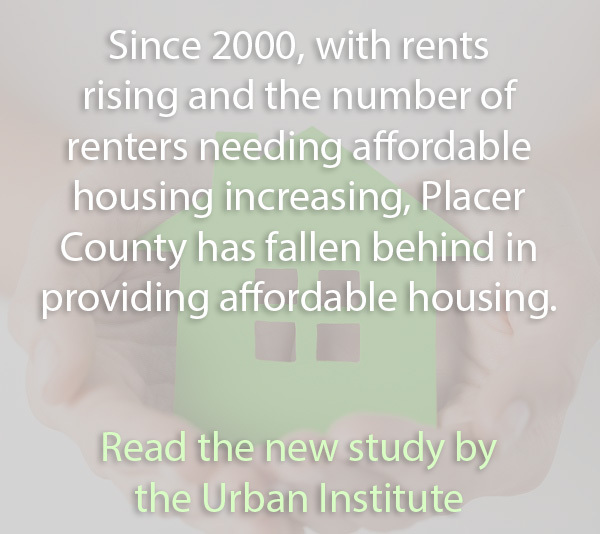 This is happening because of dedicated housing supporters who have teamed up with Placer Housing Matters to pave the way to affordable housing. I am being forced to move out of state due to shortage of affordable housing for seniors. I have to leave my family and community I have lived in for 40 years. There are many many seniors in my same position. Please keep in mind baby boomers are here. A lot of us had to use 401k funds to get us through last recession. I feel another coming on with the state our country is in. Cut backs to social security, Medicare, everything we invested in. Be aware.